With the UK leg of The Dark Knight Rises shoot kicking off this week The Establishing Shot brings you another rare and exceptional set of photos from Stefan Lange. This time from his work on the set of Tim Burton's Batman. Batman was shot on locations all over the UK including Pinewood Studios where Gotham City was recreated - as you can see in the photos below. Basically a Derek Meddings painted canvas with some miniature flats in the foreground. A big roll of shiny dustbin-bag like plastic (Astrolux?) on the floor for the river and a model road bridge crossing over it. The bridge had 'rope lights' along the roadway which were pulled along by hand to look like traffic. 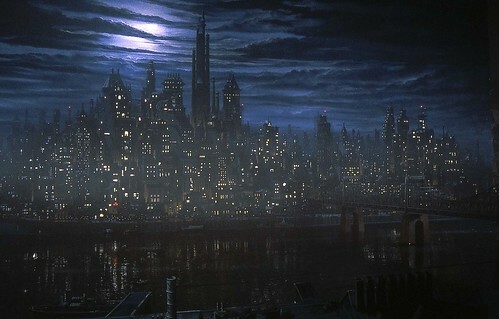 Establishing Shot of Gotham City, a photo by Stefan the Cameraman on Flickr. A model batwing for crash sequence. Very fragile as most of the outer structure was made of pewter so that it would buckle realistically on impact. 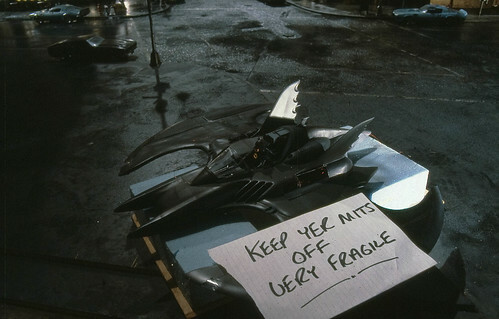 Tim Burton's Batman - Batwing, a photo by Stefan the Cameraman on Flickr. Suspended 'rise and fall' motion control rig designed and built by Peter Talbot for Gotham City model unit photography. Tim Burton's Batman - Gotham City Miniature, a photo by Stefan the Cameraman on Flickr. 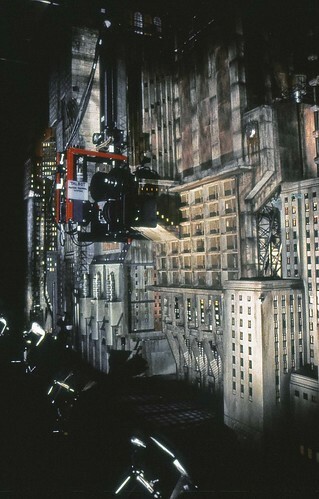 Tracking shot along a model Gotham City street. 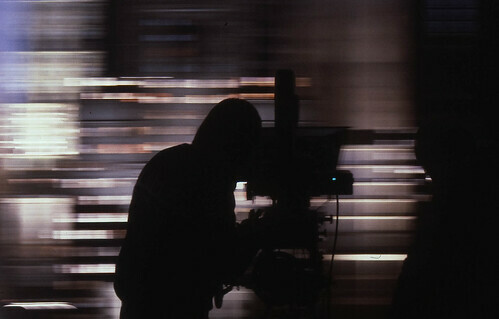 Looks like Jonathan Taylor, Focus Puller for the visual effects unit on camera. 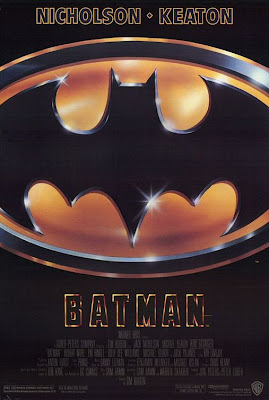 Tim Burton's Batman, a photo by Stefan the Cameraman on Flickr.